Dah-lings, I’m here in Hollywood, hobnobbing with all of the other famous people. 🙂 Of course, one thing I have always loved about being a voice-over actor is that you really can be famous and completely anonymous at the same time! I was delighted when I realized that I would be flying to Los Angeles today of all days. Today, 17 June 2006, just happens to be Barry Manilow‘s 63rd birthday. You may think that he is just a legendary singer/producer/arranger/composer with millions of fans and record sales, not to mention an all-around nice guy. However, I invite you to read the page on my web site for his inspirational advice to singers, voice-over talent and anyone who must perform for a living. I suppose you might think I am starstruck since I have seen Barry Manilow in concert (gasp) 49 times. I’m convinced that people become fixated on celebrities when something is missing in their own lives. Barry brought music back to my life, and he was one of the catalysts to my pursuing my voice-over career. It’s no wonder that I would seek him out on his birthday, especially since I don’t live in California. How often would I get the chance be around a bona fide star? Before I continue, I should probably tell you that, even though I was thrilled to touch my favorite star, the cops were never called. In fact, I think I did a favor for him as I brushed away some dirt that had smudged the face of that magnificent star. Still, you should be prepared for the graphic pictures that follow. They are not suitable for everyone. Consider yourself warned! I didn’t need a map of the stars’ homes to find Barry. I first used Google to find the general street address where I might find him. My husband has a GPS that provided me with landmarks in the area so I could pinpoint Barry’s approximate location. Even armed with all of this specific information, my quest took longer than I thought it would. Barry has always been somewhat of a reclusive celebrity, and I guess I should have realized it would be no walk in the park to find Barry in Hollywood, land of the stars. Actually, it was a walk down Hollywood Boulevard that led me to finally find Barry Manilow and share a birthday moment with my favorite shining star! Oh, c’mon now! You didn’t really think I was talking about seeing the MAN, did you? He doesn’t even live in Hollywood! Besides, I’ve got MUCH better things to do with my time than being a stalker! 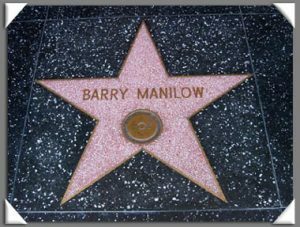 Should you be interested in personally gazing upon Barry Manilow’s star on the Hollywood Walk of Fame, here are the incredibly easy directions to finding it. Ride the Metro system Red Line to the Hollywood and Vine station, which gets my vote for most unique interior design in a subway station. 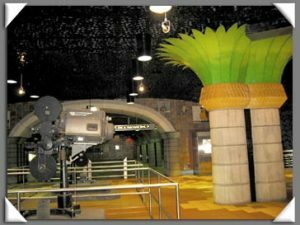 Cast your eyes on the thousands of film reels on the ceiling before exiting on Hollywood Boulevard. 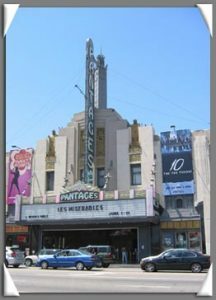 Across from the Metro station at 6233 Hollywood Boulevard is the beautiful Pantages Theatre. Barry’s star is directly in front of the theatre, on the threshold at Will Call, pointing inward. (Barry has some good company in front of the Pantages, including the stars for Billy Joel and Sir Andrew Lloyd Weber.) If you are standing at the Metro station facing the Theatre, I think the nearest crosswalk is to your right at Argyle. 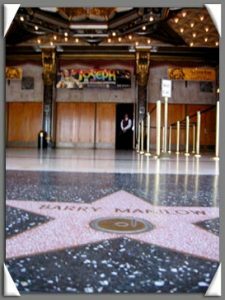 And if you DO happen to run into THE MAN himself while visiting Barry Manilow’s star, please tell him to check out my web site and blog!